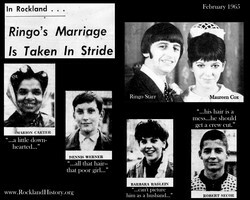 Fifty years ago, the Journal News reported on the effects of Beatle Ringo Starr's marriage on Rockland County youth. We are proud to announce that since February 2015 the popular feature "This Week in Rockland," published weekly in the Rockland Review, is being compiled by the Historical Society of Rockland County. Each week, various historical events and news stories will be featured. "Preparing 'This Week in Rockland' is a natural fit for the Historical Society of Rockland County," says Executive Director Susan Deeks. "A significant part of our mission is to share the history of the county with the people of the county, and with the Rockland Review’s wide and large circulation of both traditional newspapers and online content, the audience will be increased." Clare Sheridan, who moderates the monthly history radio program "Crossroads of Rockland History" on WRCR 1300 AM, will compile the content for the weekly column. "This is a terrific research opportunity for me," Ms. Sheridan said. "With 2015 marking the 50th anniversary of the HSRC’s charter, the stories from 1965 are of especially great interest to the HSRC and, we hope, to Rockland Review’s readers." The weekly Rockland Review is available online at http://www.rocklandreviewnews.com. Free copies are also available for pickup at many locations. A list can be downloaded below. In addition to these outreach efforts, the Historical Society of Rockland County publishes a quarterly history journal, South of the Mountains. The printed magazine, published continuously since 1957, is available as a benefit of membership in the Historical Society of Rockland County. Information about membership in the HSRC is available at http://www.rocklandhistory.org/product.cfm?category=17. The Historical Society of Rockland County is a nonprofit educational institution and principal repository for original documents and artifacts relating to Rockland County. Its mission is to acquire, preserve, and exhibit objects, buildings, and sites that reflect the history of Rockland County and the Lower Hudson Valley and to research, document, promote, and publicize the county’s rich historical heritage for the people of Rockland. The HSRC’s headquarters at 20 Zukor Road in New City consist of a four-acre site featuring the 7,200 square foot History Center; the historic Jacob Blauvelt House; and the post-and-beam Historic Barn and Carriage House. appointment by contacting (845) 634-9629. For additional information about HSRC, visit our website at www.RocklandHistory.org.